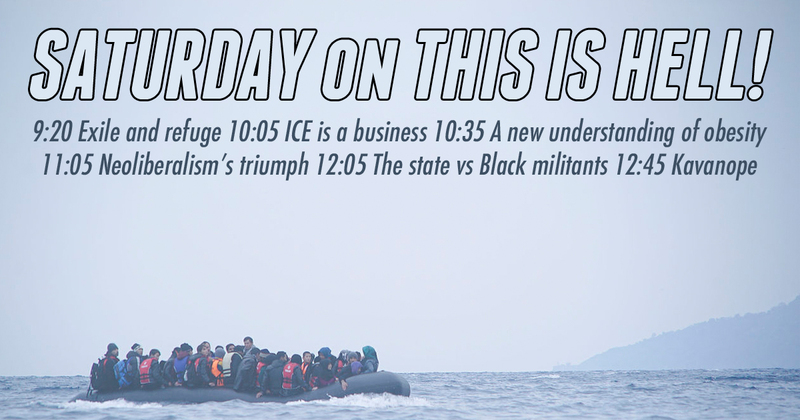 9:20 - Journalist Daniel Trilling follows the refugee crisis into Europe's exclusion apparatus. Daniel is author of Lights in the Distance: Exile and Refuge at the Borders of Europe from Verso. 10:05 - Writer David Dayen examines the big businesses powering the immigrant detention machine. 10:35 - Reporter Michael Hobbes explains what the health industry gets wrong about obesity. Michael Hobbes wrote the article Everything You Know About Obesity Is Wrong for Huffington Post's Highline. 11:05 - Writer Adam Kotsko explains how neoliberalism swallowed the world. 12:05 - Sociologist Brittany Friedman surveys state punishment of Black militant prisoners. Brittany is co-author of the article Solitary Confinement and the Nation of Islam for The Immanent Frame. 12:45 - In a Moment of Truth, Jeff Dorchen goes down the Kavanaugh hole. Gross, however you read this.